Co-founder, host, and producer Linda Khoury provides a space for Arabs around the world to do in depth explorations of the issues of the day through their own eyes and experiences. Linda is also producer of the public affairs morning show Up Front. She was previously a producer for Arab Talk Radio on 89.5FM and assistant editor for the Journal of Palestine Studies in Washington D.C. Early in her career she served as a translator and voice over talent for the Mosaic Intelligence Report on Link TV. Linda holds a BA in Middle Eastern and North African Studies from UCLA and an MA in Global and International Studies from UC Santa Barbara. 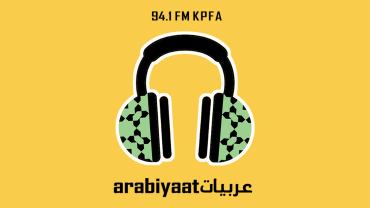 Episodes are produced at KPFA’s radio studios in Berkeley, CA. Visual content created and managed by Visual Intentions.